Following up her major success with Milk and Honey, poet Rupi Kaur brings a new collection of poetry to her audience. In The Sun and Her Flowers, Kaur explores relationships with herself, her mother, men, and society at large. With each section themed by relationship and the conflicts found in those relationships, Kaur also finds focus on concepts such as identity, feminism, immigration, racism, and beyond. Concise language pairs with simple illustrations to pull this reasonably-sized collection of poetry together and follow up on one of the most well-known collections of poetry of late. In the section about breakups, Kaur mixes language that feels entirely fresh and original while other poems spout out the same kind of melodramatic and eye-roll-inducing phrases you’d expect to find in your middle school journal. Though Kaur is forced to use dramatic language due to her extremely pared down style (most of the poems are still no more than a dozen or two dozen words at most — a couple exceptions extend into a full two pages’ worth of words, albeit with still very short lines), the cliches she employs in this “chapter” in particular feel especially cheap. Meanwhile, in poems about her mother, Kaur presents a relationship with plenty of gray areas and conflicting feelings that are displayed with powerful language and ideas. From admiration to resentment, though Kaur speaks in specifics with particular attention to her mother’s status as an immigrant and what that means for Kaur, the notions Kaur illustrates are largely universal. Readers will find plenty of familiar material in the collection as a whole, but some of the more striking pieces sit within the context of Kaur and her mother’s relationship. The Sun and Her Flowers is somewhat lengthy; not all of the pieces included necessarily should have been. While Milk and Honey felt to be a good length, many of the poems in The Sun and Her Flowers felt extraneous and repetitive. 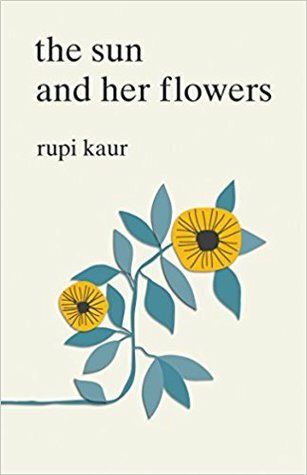 Given that a handful of poems felt especially like extracts from a middle school journal, the length of The Sun and Her Flowers doesn’t make sense, except that due to the popularity of Milk and Honey, Kaur and her editors likely felt they could get away with a longer piece and that fans might want it regardless of the actual quality. The illustrations of the poetry are still a great addition to the work as a whole. Simple, wiry, and beautiful, each drawing works to provide additional dimension and emotion to the page. Despite their simplicity, however, the illustrations are always clear in what they are meant to be, even when their representation does not quite match the content of the poem with which they are paired. Overall The Sun and Her Flowers is another win for Kaur. Though not a perfect set of poems and lacking in some places in one way or another, fans of Milk and Honey will appreciate a return to many themes (if it’s perhaps a bit limiting) in overlapping concepts while finding new life in poems about mother-daughter relationships. Kaur’s concise and powerful language continues to make her work incredibly accessible and therefore a popular choice for an entry point to poetry. An easy metaphor of plants and growth underscores this accessibility as well as the stark femininity with which Kaur themes her collection. Though you don’t need to rush out and buy this one, it is worth a read.